The report ranks all 156 member nations across the globe for their happiness inducing IT technology, government policies (that’s the UK screwed, then…), income, community spirit and, generally, how smiley their citizens are. For the second year in a row, the Finns have emerged on top of the Happiness Index. I feel this is mainly due to the fact that their country is pretty amazing. 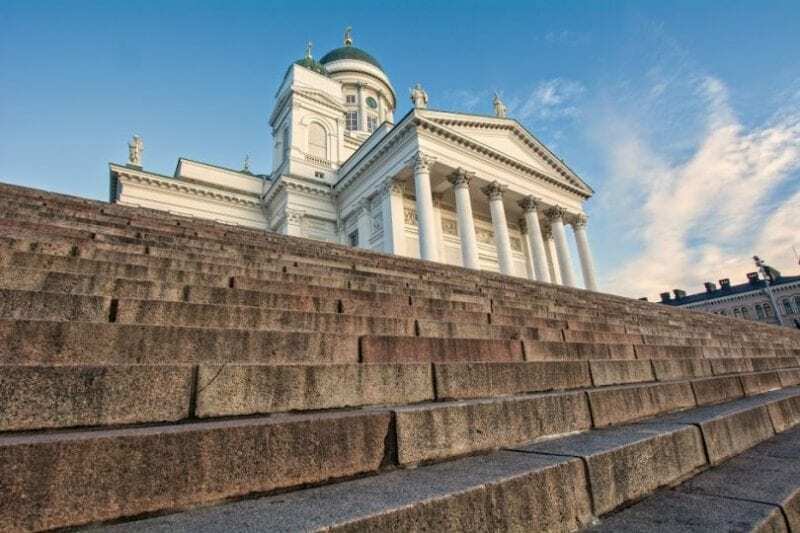 Finland has some amazing sights to visit, including Suomenlinna Fortress in Helsinki, the Arctic Circle to the north and the stunning town of Turku to the south. While I was researching this article, I decided to check up on how many times Finland has won the Eurovision Song Contest. I wanted to see if there was any correlation between this and their happiness levels (because why wouldn’t there be?). As it turns out, there is not. Finland won the ESC in 2006 but has managed to…FINNISH last a whole bunch of times. God, I’m hilarious. Anyway, clearly, the Eurovision has zero impact on the happiness of Finnish citizens, which can only be a good thing. Also, it’s reassuring to know that bordering Russia also seems to have little effect. Hot on the heels of their upbeat Scandinavian neighbours, Denmark makes it to number 2 on the 2019 index. The Great Danes (see what I did there?) successfully knocked off Norway – who was second in 2018 – to claim the ‘Very Happy Nation (But Slightly Less Happy Than Finland)’ title they’ve had their eyes on. Denmark is the land of the wonderfully colourful houses of Nyhavn in the capital city, Kronborg Castle in the northern town of Helsingborg, and Egeskov Castle to the south, near Kvaerndrup. Denmark has held the Eurovision Song Contest title on three separate occasions, with their last victory coming in 2013. They’ve only been last once. Again, this appears to bear absolutely no relation to their happiness levels, but now I’ve started this, I feel compelled to keep it going. Also, d’you think people from Finland think people from Denmark are miserable? It comes as no surprise that another Scandinavian country sits in third place. Although Norway was second in 2018, it hasn’t fallen too far in 2019 meaning it’s still a very happy place to live. Having visited Norway and spent money on beer, I am slightly surprised by this because HOLY CRAP is it expensive. However, when the wages and standard of living are high, it’s not as expensive for the residents as it seems to visitors. Norway is the home of the gorgeous Bygdoy Island with its plethora of museums, the spectacular views from Geirangerfjord, and the amazing Atlantic Ocean Road in Eide. Norway’s run in the Eurovision Song Contest has been a veritable rollercoaster ride for its citizens. Although it’s slain the competition three times, it also has the honour of finishing last more times than anyone else. Given the UK has been part of the competition on all these occasions, that’s quite an achievement. Standing firm at number four on the list for the second year running, it’s the Land of Fire and Ice. With some of the scariest volcanoes in the world, as well as some of the biggest glaciers, Iceland is nothing if not a contented wee nation. Famous for its views of the Northern Lights, the darkness of its winter days and its incredible hot geysers, as well as being one of the happiest nations, it’s also consistently voted as one of the world’s most beautiful. In Eurovision Song Contest terms, Iceland has only been involved since 1989 and has yet to win. It did, however, finish last in 2018. Again, this proves beyond a reasonable doubt that no one cares enough about the Eurovision Song Contest enough to let it get them down. Casually breezing into 2019’s fifth spot (and giving the old Spanish archer to Switzerland) is The Netherlands. The Netherlands isn’t just made up of the provinces that constitute Holland, you know. There are a further 10 provinces in the Kingdom that are just as happy. The Netherlands also happens to be the most densely populated nation in the EU, which proves that not everyone is as miserable as I am when surrounded by Too Many People. The Netherlands is world famous for its colourful tulip fields, being the home of the largest collection of art by Vincent Van Gogh in the Museum that bears his name, and the Maastricht Underground, amongst others. So, on to the important bit… How good is The Netherlands at singing in the Eurovision??? Well, pretty good, actually. The Netherlands has won the competition an impressive four times. However, their last victory came in 1975 and they’ve been last another four times. I have no real idea where I’m going with this, tbh, so take from this what you will. 6: Switzerland – famous for chocolate, skiing, watches and bank accounts. Has won the ECT twice and finished last nine times. Nine. Times. 7: Sweden – famous for flat pack furniture I can’t assemble, dynamite (for when I tire of the furniture I can’t assemble), and the, quite frankly brilliant, Chef from The Muppets. The Swedes have won the EST six times, making them second only to Ireland. The fact that they sent Abba to annihilate the competition in 1974 with ‘Waterloo‘ remains the single best thing to ever happen in the history of the competition (and possibly the world). 12 points for them. 8: New Zealand – the land of wonderful, caring people and an amazing female PM sits at number eight. Famed for its scenery, being the filming location of Lord of the Rings, its amazing Maori culture and, not forgetting its rugby prowess, Kiwis are a happy bunch. Sadly for New Zealand, it’s not eligible for the Eurovision. Don’t feel too sorry for them, though; they also don’t have to watch it. 9: Canada – a nation of people who drink double-doubles (coffee with two creams and two sugars), say ‘sorry’ for things that aren’t their fault, and worship at the altar of Tim Horton is a pretty great land to be part of. It was also the location of my second ever John Mayer concert, so it holds a special place in my heart. Like New Zealand, Canada isn’t close enough to be part of the ESC. This is very sad for them because they could’ve put forward Bare Naked Ladies featuring Bryan Adams and won moose paws down. 10: Austria – Having recently returned from Innsbruck, I have to say that I did notice how contented Austrians were. Living in the shadow of the Alps, having produced classical masters, such as Schubert and Mozart, and inventing ballroom dancing, its clear to see why they’re a right cheery bunch. Given it’s so famous as the setting for The Sound of Music, Austria has only won the Eurovision twice, which is pretty disappointing, to say the least. Mind you, Julie Andrews isn’t actually from Austria so they couldn’t make her perform for them. She’s British, so God only knows why we haven’t made her sing for the UK. Talk about a missed opportunity. Anyway, on top of their two wins, Austria has finished last seven times. Side note: Although the happiest nations are just OK at the Eurovision, it’s very interesting that all top five nations are *eligible* to participate. Coincidence?? The United Kingdom placed 15th on the survey and the USA was 19th. South Sudan was the worst performing nation, finishing last in 156th position. Anyone up for a move to Finland?